Michael has been at the shop for a few months now and we are proud to announce his very first pattern: Fulton! 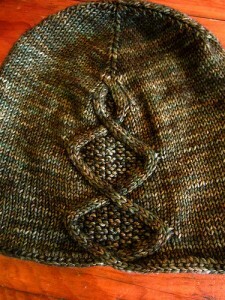 This lovely little hat caught my eye last Friday because it has 2 things I love right now, cables and Madelinetosh DK. Michael knit this little wonder up in a great fall colourway too, Terrarium. The cable detail adds a little extra something to this toque and it has that ‘fresh off the slopes’ look about it. I’m picturing a blustery fall day with me in my North Winds Hat and my hubby in a Fulton…. The hat is of a rare breed, it works for guys and gals alike. It’s not always simple to find a toque pattern that the male of the species will happily wear but I think Michael has done it (and who would know better really?). One skein of Tosh DK is all it takes so cast on for a Fulton hat today! The patter is available here on Ravelry. This entry was posted on Tuesday, October 25th, 2011 at 10:54 pm	and is filed under Uncategorized. You can follow any responses to this entry through the RSS 2.0 feed. Both comments and pings are currently closed. 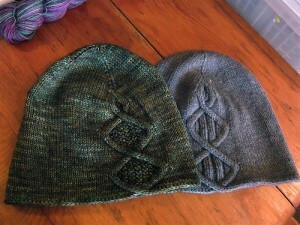 I love this hat- So cool how the icord CO goes into the cable- innovative. Perfect holiday gift idea for the guys in our life!